"Remake a not-so-healthy classic and give it a playful, nutritious twist! 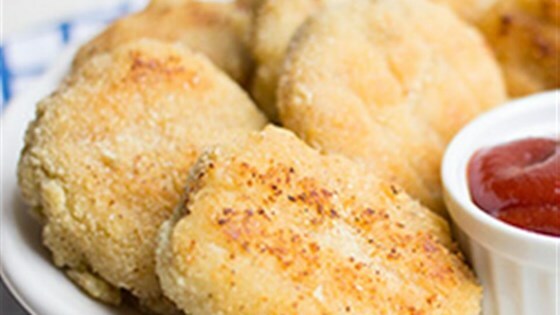 We use our almond flour as the coating and bake these chicken nuggets until crispy - you'll get that satisfying crunch, without the fryer." Preheat the oven to 375 degrees F. Place an oven-safe wire rack on top of a baking sheet and set aside. In a large mixing bowl, combine the chicken, 1 teaspoon each salt and pepper, and the additional spices. Mix until fully combined, and set aside. In a separate bowl, whisk together the almond flour and remaining salt and pepper. Set this bowl aside as well. In a third bowl, whisk together the cornstarch and cold water to form a slurry. With wet hands, take about 2 tablespoons of chicken and shape it into a small disk. Coat first in almond flour, then dip in the cornstarch slurry, then coat again in almond flour and transfer to the wire rack (which is on top of your baking sheet). Repeat this process until no chicken remains. Heat the 2 tablespoons olive oil in a non-stick skillet. When hot, add half the chicken nuggets to the pan. Cook for about 1 minute, until the bottoms begin to brown. Flip and cook for another minute to brown the other side. Transfer the nuggets back to the wire rack. Repeat this cooking process until all the nuggets are browned. Place the entire baking sheet (with the wire rack on top) on the oven's center rack and bake for 10 minutes. Remove the nuggets from the oven, flip them over on the rack, and let them cool. Yield: 12 to 20 nuggets, depending on size. Our 9 yr. old made these for dinner and they were awesome! She used ground turkey in place of the chicken. The nuggets were reminiscent of sausage. We will request these again! I’ve made these twice now because we loved them so much. They are filling and delicious. I added some sriracha to the meat to make the nuggets spicy and I’ll definitely be making them again soon!